Take it outside! In Coastal Alabama you’ll find endless options for enjoying the great outdoors. Honor heroes at the USS ALABAMA, race a go-kart or hold on for a roller coaster thrill in Foley. Parasailing fun in Gulf Shores and Orange Beach. Take an airboat ride with a local expert, where you’ll see flora, fauna, birds, alligators and other wildlife native to Mobile Bay. Climb aboard the USS Alabama Battleship and USS Drum, the oldest American submarine, where you get up close and personal with giant battleship guns and life as a soldier on a battleship and submarine. Here, you can also explore a B-52 Bomber, a famous WWII submarine or a flight simulator at USS Alabama Battleship Memorial Park. Take a Delta Safari Cruise from the 5 Rivers Delta Resource Center, where you can see all kinds of gators, fish, birds, riverside animals and flora and fauna of the Coast. If you’re up for speed, definitely try the Airboat Express! Learn about the wildlife of the Mobile-Tensaw Delta while having the thrill of a lifetime. You won’t forget it! 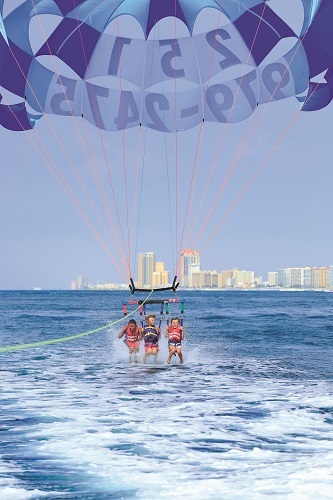 Parasail, wind surf, jet ski, or gather a group on a banana-boat tube ride over the waves or through beautiful Perdido Bay waters in Gulf Shores or in Orange Beach. Fly through the air on an eight-tower zip line course, stretching over The Wharf in Orange Beach and its beautiful marshes, wetlands and entertainment options. Race a go-kart, zip down dozens of giant water slides at high speed, or bungee-plunge from a sky-high platform at one of the several amusement parks in the area. Dive deep below the surface and explore many sunken ships, cars and other interesting things at the largest artificial reef in the Gulf of Mexico. Or dive down to Poseidon’s Playground and snap a selfie with one of the many unique sunken statues. Prepare for thrills and chills at The Park at OWA. The Park offers 21 amusement park rides, an interactive splash pad and a great selection of traditional Midway games. After you work up an appetite, stop by Downtown OWA for ice cream, lunch or dinner. Hit the stands and watch race car drivers burn up the asphalt at the International Speedway in Bayou La Batre. Once your adrenaline is pumping, head to the Greyhound Dog Track, where you can test your luck and end the day with a big win!